Hot Remixing is an environment friendly and economical road rehabilitation technology to repair top layers of the asphalt structure. 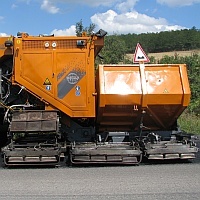 During hot remix process the damaged and aged layer is heated up to plasticity, milled off and with necessary additional repair mix and rejuvenator added, passes through a compulsive mixer before laying back on the road. The whole “In-situ” Hot Remix process is completed in a single pass of the remix equipment chain. 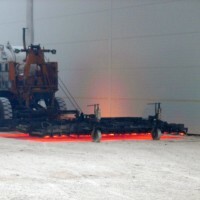 The top layer of the asphalt is heated up by means of infra preheaters travelling in front of the Remixer and the infra panels on the Remixer itself. The hot pavement is milled off with a scarifier unit, binding agent is injected into the material in a precisely proportionate manner and homogenously mixed in a twin-shaft compulsory mixer. The remixed asphalt is then laid back on the still hot sub-layer giving a “hot-in-hot” binding effect between the asphalt courses. Remix-Plus technology is an enhancement of the Admix process. 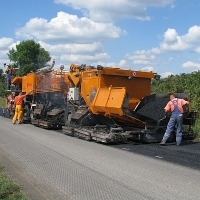 The existing asphalt is treated the same way as in ADMIX process, but on the top of the pre-compacted remixed layer a thin layer of new asphalt mix is added. This is carried out with the help of a second screed on the remixer, which is precisely set in reference to the first screed. 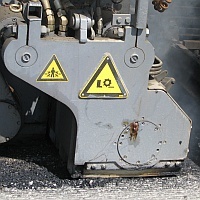 Since the two asphalt layers are compacted together “hot-in-hot”, the thickness of the virgin thin remix-plus layer can be thinner than the standard for that mix. In practice the joint thickness of the two layers is 4-6 cm. The road rehabilitated with Remix-Plus technology has the same mechanical, road safety and visual characteristics as a new asphalt surface. This is an economical version of the remix process to repair roads where the existing asphalt material needs no improvement but geometrical correction only. The technological chain is the same with the exception that, apart from some bitumen or rejuvenator, no additional asphalt mix is added. Hot recycling is economical, for it saves between 20% and 30% in terms of construction time, transport costs, energy and natural resources.